It’s my intention to review as many role-playing, board, and card games of interest to anarchists for AGR as possible. With each review I’ll provide an overview of the game, recommend it or not based on actual play, or in the case of many RPGs, how I “think” the game will play at the table. And of course, I’ll include how the game might be useful for radicals. This won’t always be applicable, because sometimes games are just fun, but I believe games can help us build the communities we envision, improve our abilities to resolve conflict, and strengthen our strategies for change. 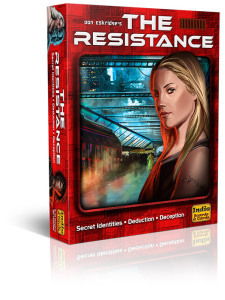 Set in a far future dystopia, The Resistance is a deduction and bluffing game, similar to such games as Mafia or Werewolf. Players are members of a generic resistance movement who must complete missions to overthrow the empire. The catch is that some of the players are infiltrators. At the start of each game, each player is assigned a hidden role–either they are a resistance member or a traitor. There are five rounds of play. Each round a mission is proposed that involves some of the players at the table, the size of the mission team increasing as the rounds go by. The leader for that turn proposes a mission team, which all players vote on. Once a team has been approved by the players, the mission goes forward. If the players can’t agree on a mission team after five votes, the mission fails. During each mission, the team members secretly play a card that determines if the mission is a success. One team member playing a “fail” card results in a win for the Empire. If no “fail” cards are played, it is a win for the Resistance. Whichever side wins 3 of the 5 rounds wins the game. After each round, the leadership role moves around the table and discussion takes place regarding the next mission team. Sounds pretty simple right? Yeah…just wait until the first accusations start to fly. The fun begins early in this game; simply setting up what the resistance is all about is a ton of fun. While the default art and setting details are a future dystopia, mechanically there is nothing preventing the players from creating a different resistance. With an open setting and missions, a lot of creativity is left open for the players. There is room for a lot of role-playing at these stages of the game. Want to setup your missions during the Spanish Civil War, defend the forests of the Northwest, or rebel against the mega-corporations of the future? Go ahead, they all work. I can see just this phase of the game being a lot of fun for many people. Raid the fascists’ compound or do a banner drop off Golden Gate Bridge–the missions can go anywhere you want them to go. In addition to simply being fun, creating a resistance that players actually care about may greatly increase the tension in the gameplay. As missions succeed or fail, the players will feel more invested in the outcome. With this buy-in, the discussion and accusations will likely be more intense. Now, this game might not be for everyone–you have to be able to separate the game from real life, and I can see how anyone who has had to deal with real infiltrators may have some issues with the game. -In the group I played with, deep feelings come up. Why people chose to believe or not believe other players was interesting, revealing, and even a little painful since we were all friends. This is more of a heads up and less of a reason not to play. What I’ve described is the basic game. There is also an advanced style of play that adds mission cards that affect gameplay and add replay value. The copy reviewed is an early edition, but the newest version can be found for under $20 and has pretty solid components and high quality art. For those players who might not be as interested in a far future setting the game also has a version set during King Arthur’s court, The Resistance: Avalon. Introduce the game and the simple mechanics and ask the players to think about how they interact with others during the course of the game. Play the game without commenting on any feelings brought up during play, but perhaps suggest players write down notes about how they are feeling and why they are making the accusations that they are. After the game is finished and the traitors are revealed, have a discussion about how the game made people feel. Why did you think someone was a traitor? Why did you think a traitor was a member of the resistance, or a resistance member a traitor? How did the traitors feel about their deception? For the group of politically minded folks I first played this game with, the experience was rather powerful. When we played, everyone knew someone at the table, but not everyone knew everybody all that well. If the traitors are playing the game well, it is extremely hard to figure out which side they’re on. They will turn members of the resistance against each other. At the end of the game, if the traitors win, members of the resistance will probably want to know why the other resistance members didn’t trust them. While I can’t say that the game alone is going to solve any particular groups problems with infiltrators or the perceived threat of infiltration, I do think it does make the participants far more likely to think critically about how the process of dealing with such a threat can be handled. Going into the game with this in mind would likely spark some quality discussion. As a simple game, The Resistance is pretty fun and interesting. But additional, I think it has huge potential for skill shares. This game would be a great addition to any game collection. I would love to play it again as a party game with the maximum number of players. With 10 or more people all talking at once, the deception and accusations would probably be even more intense. That said, I can’t see playing it a bunch of times, especially with the same people. Then again, I haven’t played it with the mission cards, which may add significantly to the replay value. I think the game works best with players who are comfortable enough to talk and discuss actions at the table, but if players know each other too well, I think there is a danger that the game may fall flat. I say this because I think if you can read a friend well then you’re might be able to tell what role they have too easily. Then again, maybe it would be interesting to play with people you know very well, because you never know for sure just who the traitor might be….